A robotic mission's search for life on Mars may seem worlds away from human scientists wandering around hot springs in Yellowstone National Park. But a study of the Yellowstone hot springs has revealed new clues about how organic materials might get preserved in similar environments on the Red Planet, bettering our chances of finding possible signs of life. Most studies have focused on the preservation of organic material in silica-rich rocks—the primary source of tiny fossils on Earth that can only be seen with a microscope. But some researchers have begun looking at how iron-rich rocks can also contain possible signs of life. Their Yellowstone hot springs study found that iron could either preserve or react with organic material in a way that helps form a fossil record. Such findings counter previous assumptions that iron-rich rocks would destroy organic material through the chemical reaction known as oxidation. "In general, many microbes like to 'eat' organic compounds, especially certain lipids, for lunch, and can destroy the bulk of the organics before they have a chance to get preserved," said Mary Parenteau, a research scientist at the SETI Institute, who is also in the exobiology branch of the NASA Ames Research Center. "Iron can rapidly entomb or bind to the organics and make them unavailable to 'eat,' similar to encasing a sandwich in cement." The researchers collected samples from both the active Chocolate Pots hot springs in Yellowstone Park and an "extinct" iron-silica hot spring nearby that had long since dried up. They had to tread lightly on the steep slope surrounding the hot springs to avoid disturbing any loose iron sediment that might slide into the water and kill photosynthetic communities of microbes by blocking their access to sunlight. That often required a "delicate balancing act" of stepping carefully on stones strewn across the slope, said Parenteau. "Often you're balancing on one foot with both hands full of meters and collecting gear," Parenteau said. "I practice 'leave no trace' sampling, and I care a great deal about minimizing impact at the site." The careful sampling paid off. In a sediment core from the active hot spring, researchers found preserved lipid molecules called 2-methylhopanoids belonging to cyanobacteria, a group of bacteria capable of converting sunlight into energy. They even found preserved fragile lipids, such as fatty acids from the cyanobacteria that typically serve as food for other microbes, or are otherwise rapidly destroyed after the cells die. "When we discovered that the cyanobacterial fatty acids were being preserved in the iron deposits—and were not produced by a deeper chemotrophic community—that forced us to consider ways in which iron may preserve rather than destroy the lipids," Parenteau explained. The iron-rich hot springs may have helped preserve organic molecules such as lipids in several ways. First, iron reacts chemically with oxygen and lowers oxygen levels in the water, which prevents oxygen-dependent bacteria from consuming all the organic material such as lipids. Secondly, iron may block certain enzymes that help break down organic material after the death of microorganisms. Thirdly, iron can even chemically bind with organic molecules to help preserve them. Robotic missions to Mars have not found signs of active hot springs. 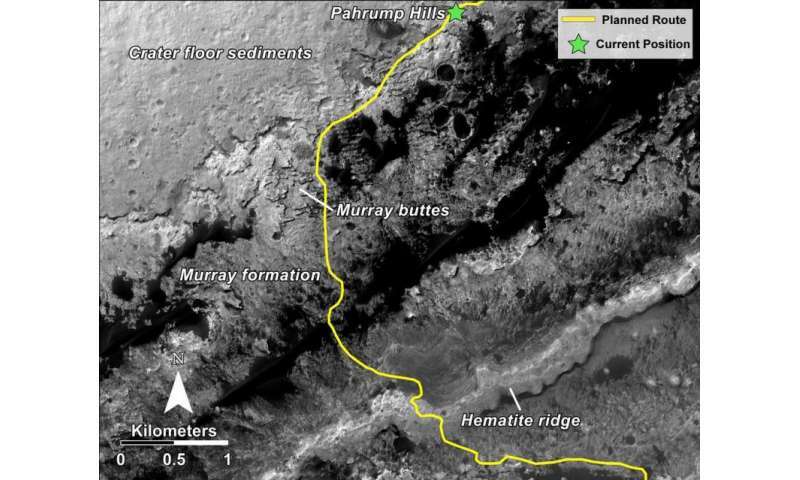 But the Spirit Rover discovered evidence of hydrothermal deposits in the Home Plate region that indicated an active hydrothermal system when the dry, dusty Red Planet was younger and held more water. 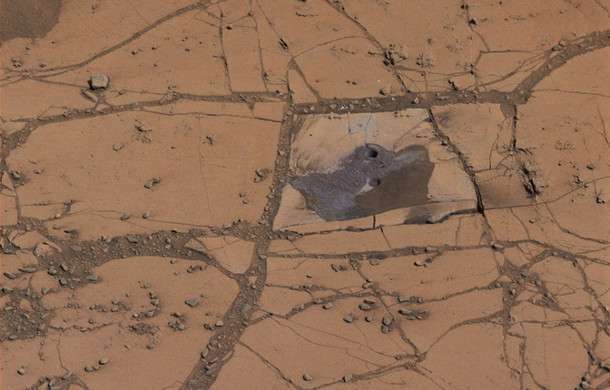 The Mars Science Laboratory Rover, a robot nicknamed Curiosity, has spent time exploring iron-rich rocks located on Hematite Ridge within Gale Crater, the mission's landing site on Mars. Parenteau and her colleagues hope that their study's findings could eventually help future Mars missions—such as NASA's proposed Mars 2020 rover—hone in on iron-rich rocks that could hold clues to any organic molecules that once existed on the planet. But they also see relevance to studies of ancient life on Earth.